This winter semester, all students and PhD students of the Faculty will again have the chance to get in touch with a potential future employer! 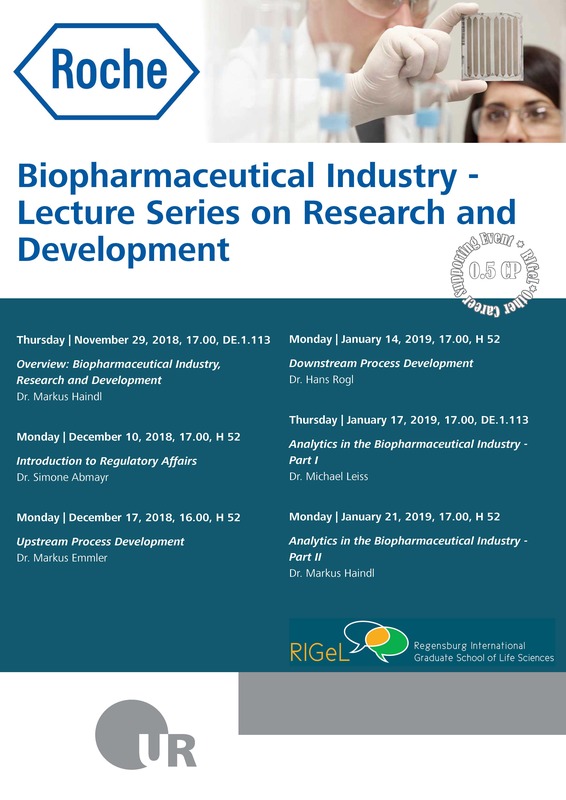 The RIGeL Excursions and Industry Relations Group organizes the second Roche Lecture Series on Biopharmaceutical Industry: The group invited five young leaders from the company Roche Diagnostics GmbH, Penzberg. During the winter term, the invited speakers will give 6 lectures on different topics such as ‘Research and Development at Roche Diagnostics’, ‘Regulatory Affairs’, or ‘Analytics in the Biopharmaceutical Industry’. Participants will not just get unique insights into the work processes of a big pharmaceutical player, but also have the possibility to get in personal contact with the speakers in a relaxed atmosphere after each lecture. This is a great chance to discuss different options for internships or job opportunities at Roche Diagnostics or get some advice on how to move on with your personal career! All interested students, PhD students, faculty members and staff are welcome to attend the lecture series. The first talk will take place on November 29 at 17.00 h in DE.1.113. Talks will be held in English!